Certified Scuba Diving in Riviera Maya. The Riviera Maya in Mexico has the second largest barrier reef in the world. Come and enjoy the biodiversity of flora and fauna in its crystal-clear waters. Scuba diving in this area is a 'must' for certified divers. Get a free digital photo captured while you discover the amazing underwater world in a safe and easy way! You will be under instruction supervision, diving along'the coral formations and colorful fishes in a beautiful spot which is part of the Mesoamerican Reef, the Second Largest Barrier in the World!! This Cozumel'scuba lesson'offers beautiful underwater scenarios where you can enjoy the quality of water services in the most beautiful island in the Mexican Caribbean. Your tour includes lunch and a professional instructor. Learn the basics of scuba diving in Cancun and take an introductory dive at one of Mexico's top scuba spots! Within no time, you'll be underwater without full certification! Practice in the resort pool and then see amazing Caribbean marine life in the open sea during your first open-water 1-tank dive! 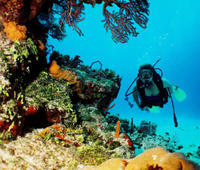 Even if you're not staying in Cozumel, you can still experience the famous dive sites in the region. Departing from Cancun, you can enjoy two dives at some of the famous Cozumel sites including the Santa Rosa Wall, Palancar Gardens and La Herradura, as well as Paradise Reef and Tormentos! Dive with expert bilingual instructors and see an amazing cast of aquatic characters as you swim amid some of the most brightly colored fish on earth! Have you always wondered what it's like to breathe underwater? If you want to try scuba diving, but aren't quite ready to take the plunge into a certification course, Discover Scuba Diving is for you!You will dive not only once as usually during Discover Scuba Diving, but twice in the open ocean! - 'at famous Underwater Museum (MUSA) with'over 500 permanent life-size sculptures and later on at beautiful Manchones Reef. Spend a day in Puerto Aventuras exploring the underwater world of cenotes, the largest underground cavern system in the world. See the fascinating limestone structures in these caves beneath the waves, all just a short distance away from Cancun. Swim around submerged stalactites and stalagmites, and see the spectacular, natural phenomenon of haloclines, a blending of fresh and salt water, all safely lead by an expert guide. Certified divers can now explore the underwater world off the Caribbean coast of Mexico! 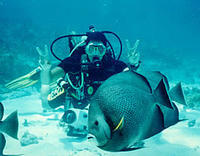 Cancun is a world-renowned diving location and offers various sites, each with its own unique characteristics. Experience the Great Mayan Reef, the newly built Underwater Sculpture Museum, a night dive, and a dive at the wreck of a C-58 Minesweeper. With exotic aquatic wildlife and four unique dives to choose from, all certified divers will be impressed with a Cancun 2-tank dive!